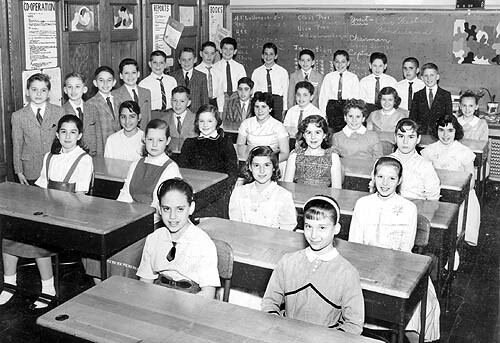 A Picture History of Kew Gardens, NY - Class Pictures - PS99 Grade 5-1 1959. Standing along the wall from far left: Paul Gusmarino, Bill Lowenberger, Herbert Bachner, Ralph Wachs, Ronald Kartman, Chris P., Stuart Rubin, Peter Capek, Michael Lesser, Bruce Barritz, Larry Sloman, Joel A., Harry Chester, Richard Siegel. First row, left to right: Iris Sandler, Vicki Meyers. Second row, from left: Cathy Simpson, Frances Franklin, Ellen Gress, Iris Levine. Third row, from left: Shirley Azizolahoff, Martha Udall, Pamela Leaman, Patricia Garber. Fourth row, from left: John W. Elaine K., Rochelle Wald, Joyce Kerrer.